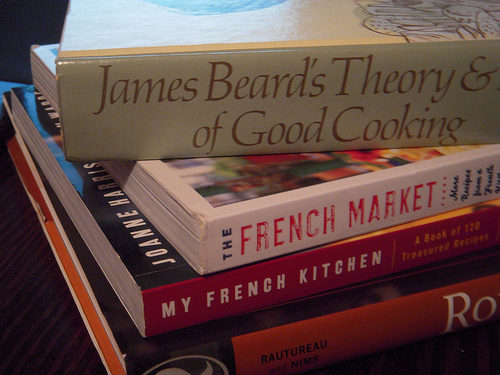 If I go: I buy cookbooks. If I go, my wallet will be a smidgen lighter. We have a great Half Price Bookstore near us; it is heavily visited, so the turnover of books is impressive. If I were to say... go there every other week, I would find boxes of 'just-in' cookbooks. Imagine the temptation. So I usually resist. But not always. And now that I have attended culinary school, a new variety of cookbooks appeal to me. Chef names are more familiar, certain restaurants stand taller in my mind, and I am hungry to read methodologies---like reading a recipe, then reading between the lines. The temptation is palpable. Oh yes that author---a must have. Cool... they cook in the French style... no brainer. Must buy. MFK Fischer? Don't leave the store without it. Classic must-read. A four star chef? Hey, I know how to make that!!?! And so it goes. And today I came home with four new books. But instead of shuffling away shame-faced, I feel my arm ache from patting myself on the back: it could have been 8 books instead of 4. I actually [ehem] saved money. And to think if they were full price! I made choices, forced myself to put books back on the shelf, squatted while I read snippets and recipes and debated whether to add or subtract that book from my already-too-high pile. James Beard's Theory and Practice of Good Cooking (took off the paper cover, and the book underneath has vintage sketches of pots and pans---looks awesome). It cost me $9 and folks, it has no pictures. Yep, I have turned a new culinary leaf. One of my chefs recommended James Beard's SAUCES book.... ehem, but I already have that one. My French Kitchen and The French Market by Joanne Harris & Fran Warde. I confess, these two books were shelved together and I tried to buy just one. Then went back the next day... to buy the other. Each $10 the pictures are glorious, wall-worthy shots of French bakery signs and cobblestone streets, baguettes popping out of bags, purses, bikes, boxes... you get the idea. But I was taken with these books in large part because the approach is in the vein of French classic cuisine, which I just finished studying for a year. I don' t know how to explain it to you, but reading these recipes made me feel like I was talking to a friend I just met... but felt I already knew and adored. Oh, and it doesn't hurt that one of the authors, Joanne Harris, is also the author of the book-gone-movie, Chocolat---do see it, if you haven't already. And then, this book snuck up on me: Rover's. I am embarrassed to say I knew so little about this restaurant, from my own city. Seattle's restaurant scene is riveting, to say the least. And this particular restaurant is one of many I have yet to grace. But it struck a chord, because many of my peers from culinary school intern at this very restaurant. So when I cracked this cookbook (just in, one of a kind, great price), I felt like I walked into the back door of the restaurant. And opened up the fridge... to see what I want to eat. What I love about this book is that it is bursting with Pacific Northwest Cuisine... which I will go into more detail later. Because right now, I am going to go read my new books.